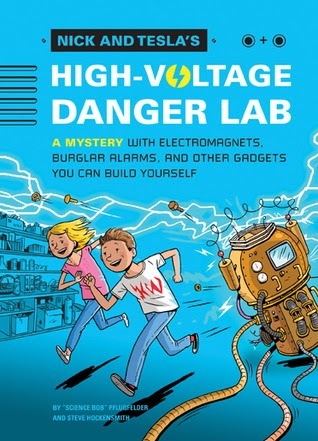 About Nick and Tesla's High Voltage Danger Lab: A Mystery with Electromagnets, Burglar Alarms, and Other Gadgets You Can Build Yourself*: Nick and Tesla are bright 11-year-old siblings with a knack for science, electronics, and getting into trouble. When their parents mysteriously vanish, they’re sent to live with their Uncle Newt, a brilliant inventor who engineers top-secret gadgets for a classified government agency. It’s not long before Nick and Tesla are embarking on adventures of their own—engineering all kinds of outrageous MacGyverish contraptions to save their skin: 9-volt burglar alarms, electromagnets, mobile tracking devices, and more. Readers are invited to join in the fun as each story contains instructions and blueprints for five different projects. In Nick and Tesla’s High-Voltage Danger Lab, we meet the characters and learn how to make everything from rocket launchers to soda-powered vehicles. Learning about science has never been so dangerous—or so much fun! Nick and Tesla are super smart kids and they find themselves exiled to their absentminded yet brilliant inventor Uncle Newt. Bored out of their wits, they explore the neighbourhood and stumble upon a mysterious girl in a seemingly old abandoned house. Who is she? Why does she look so sad? Why is she in that old house? Spurred on by these questions they seek to learn more, aided with some gadgets they make themselves! I certainly may not be the target audience for this book but I loved this! This is excellent reading for middle grade kids (or excellent reading to younger ones)—crammed with plenty of adventure, a mystery, and some real-deal gadgets/science experiments to make and try ... guaranteed to keep the kids occupied (under adult supervision, of course). The book is a combination novel and how-to guide of science experiments, complete with very easy to follow diagrams. Let's call it a hands-on novel! The storyline lets the mystery unfold very nicely and the gadget-making is crucial to the storyline so it never feel like the how-to's interferes with the narrative. It's a simple story but it is a smart one ... everything is logical. Kids actually behave like kids. I think that children reading this will be able to relate to Nick and Tesla -- they certainly act like brother and sister with their constant ribbing of each other, and they may be brainy, but they're not annoyingly nerdy. The smarts they show make them "cool" and is something to aspire for. Science is also presented in a wonderfully fun way, a cool nerdy! The gadgets to make and how it's presented with wonderfully detailed illustrations! If you're familiar with Science Bob then you may already appreciate the humour and fun he brings to learning about science. His team-up with Steve Hockensmith has produced this first book in a series that I feel is bound to be a hit among middle graders. Make your kids' learning about science cool and fun with this mystery book! Lots of hand-on gadgets to make, a smart story injected with lots of clean humour. I highly recommend this book (and this series) for middle grade readers. I received a copy of this book from the publisher in exchange for an honest review. Thanks, Eric of Quirk Books!